What Day Of The Week Is December 26? 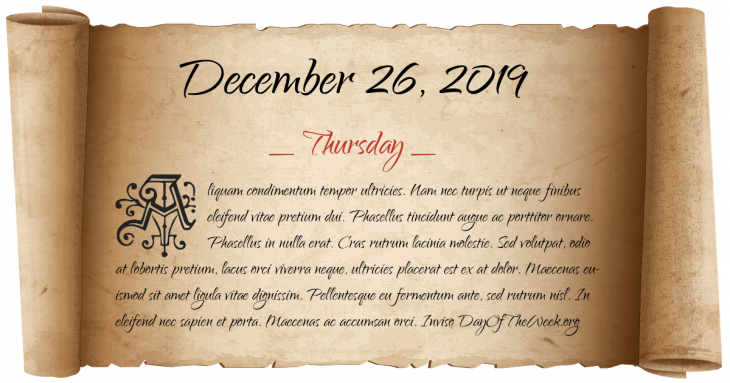 December 26, 2019 is the 360th day of the year 2019 in the Gregorian calendar. There are 5 days remaining until the end of the year. The day of the week is Thursday. Robert Carr, 1st Earl of Somerset, marries Frances Howard. American Revolutionary War: The British are defeated in the Battle of Trenton. The final trial of Louis XVI of France begins in Paris, France. The wedding of Prince Friedrich Ludwig of Prussia and Frederica of Mecklenburg-Strelitz takes place. Trapped in snow in the Sierra Nevadas and without food, members of the Donner Party resort to cannibalism. Turkey adopts the Gregorian Calendar. The Tupolev Tu-144 SST goes into service in Soviet Union. Six-year-old beauty queen JonBenét Ramsey is found beaten and strangled in the basement of her family’s home in Boulder, Colorado. Who were born on December 26?